Picture the sumptuous, elaborate decorations that you associate with Victorian-era architecture and design. Now, picture work by modern designers. These two worlds seem vastly separate—in materials, motives, and tastes. 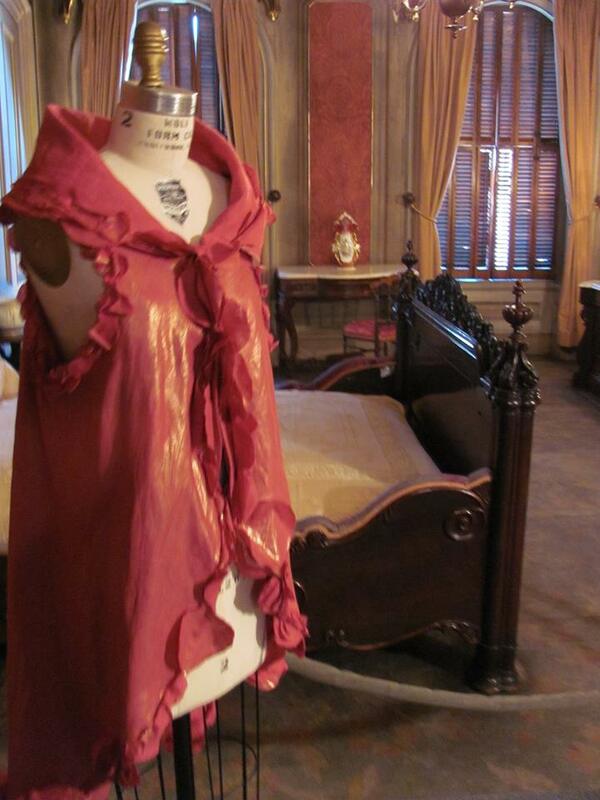 But a recent partnership between Victoria Mansion and the Maine College of Art’s [MECA] Textile and Fashion Design department proved that one era of art can provide inspiration to another. The results highlighted the beauty and strengths of each. 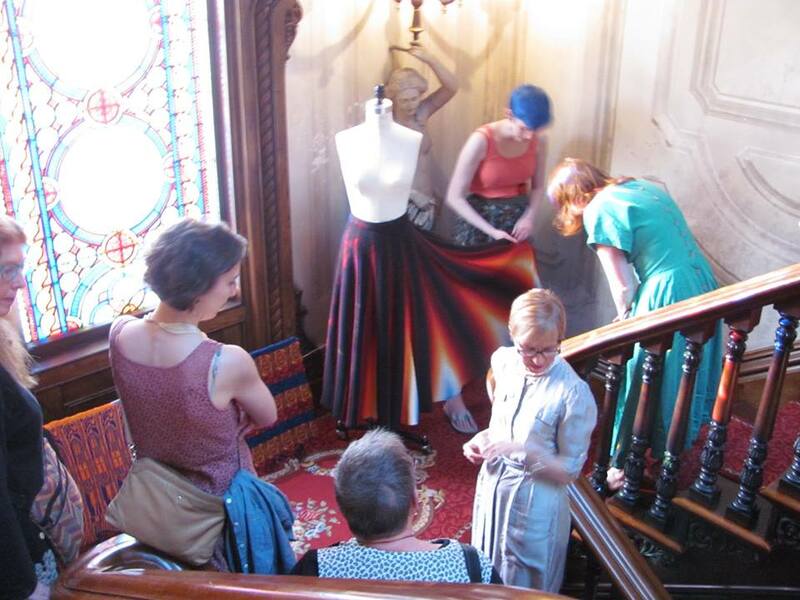 On May 6th, 2015, Victoria Mansion in Portland hosted “Inspired Design: Fabrics and Fashion at Victoria Mansion.” Earlier in the year, MECA students visited the Mansion with Professor Anne Emlien. 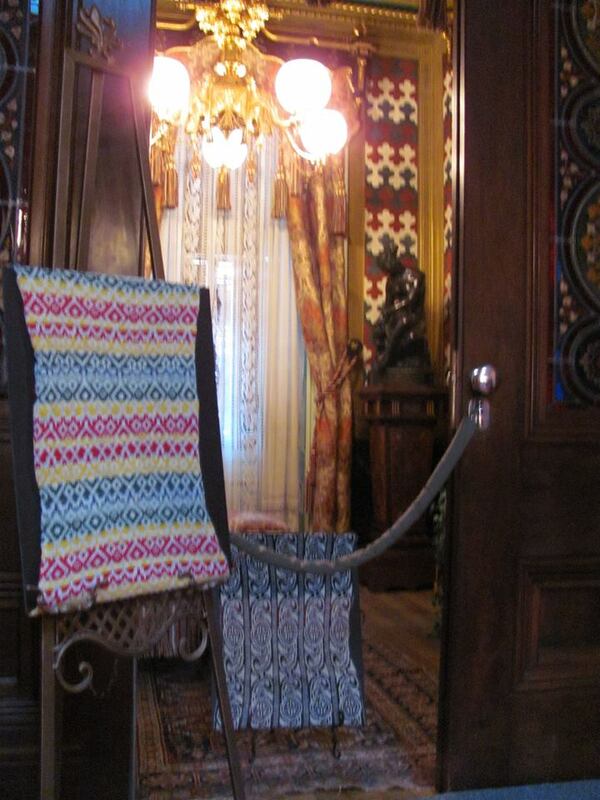 They traveled through the rooms examining details and decorations, seeking inspiration for projects of their own. The process culminated in each student creating a finished garment or textile. “It took a while to decide what to choose,” one student said, describing her first trip to the Mansion. She settled on a single butterfly, about an inch and a half wide, painted on the wall above a bathtub in an upstairs bathroom. She adapted its wing design and its bright orange, red, and brown tones to create an intricate knitted pattern, on display in the bathroom. One visit to the Mansion is enough to understand the magnitude of the students’ undertaking. “It’s overwhelming,” a visitor to the exhibit said, pointing out layer after layer of detail that went into the Mansion’s decoration. With stained glass, inlaid tables, painted portraits, silk chairs, and carved wooden walls, it seems as though no surface space was left without ornamentation. The visitor noted that it is impossible for the eye to take it all in at once; every time he entered a room he noticed a new element he’d missed before. “Inspired Design” was a way to celebrate this detail—to bring out a single element of design and highlight it on a modern piece of clothing. This special evening event was part of the Mansion’s new exhibit, “The Way We Wear: Fashion & Industry in the Nineteenth Century.” This exhibit, funded by a MHC grant, will be open through the end of October, 2015. It provides a fun and informative look at the technological, economic, and cultural changes that created the styles of the day and ultimately formed the basis for today’s fashion industry.